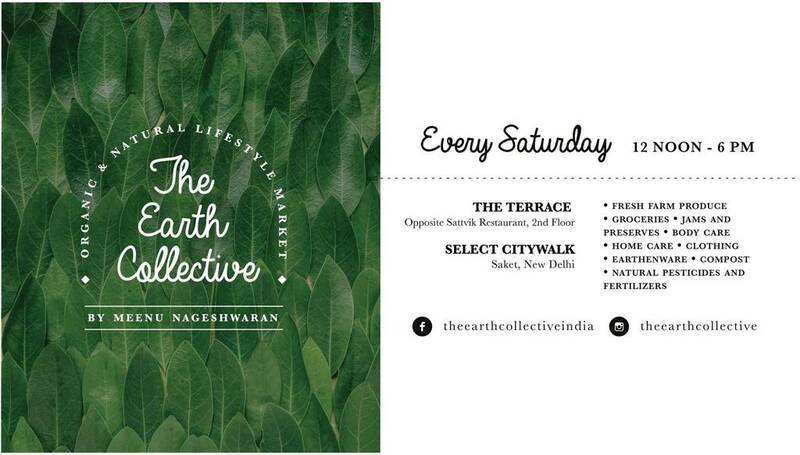 WELCOME to The Earth Collective Organic & Natural Lifestyle Market by Meenu Nageshwaran at THE TERRACE, opposite Sattvik Restaurant,2nd floor,SELECT CITYWALK,Saket,New Delhi. The Earth Collective brings you the finest who share a common philosophy - to embrace the doctrine of becoming the change that they want to see in the world. An attempt to bring like-minded, earth-friendly people together. At the heart of The Earth Collective is a deeply rooted desire to nurture our community's health and wellbeing. The choices we make collectively play a part in a growing concern about individual health and the environmental challenges of our times. The Earth Collective's organic, natural and chemical-free markets enable a lifestyle that include: fresh farm produce, groceries, artisan products, jams and preserves, beverages, body care and home care, clothing, terracotta cookware,solar products, composting, natural fertilisers, pesticides and much more that encourage consciousness around personal health, wellbeing and environmental sustainability. This unique market is a reminder to celebrate all that the Earth has to offer by embracing a greener way of life. The Earth Collective Market is a FREE and FAMILY FRIENDLY EVENT. Where : THE TERRACE, opposite Sattvik Restaurant,2nd floor,SELECT CITYWALK,Saket,New Delhi. We encourage you to carry your own produce bags to take home all that natural goodness. Thank you for becoming a part of the movement today! Health and Happiness from all of us The Earth Collective, See you there!